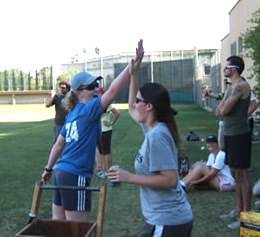 Welcome to the infamous softball team of the Caltech Seismological Laboratory. The team has been around for over 20 years. We play in the C-League, not in the competitive A-League or the drinkin' D-league, although some of us may dabble in that lower league. We play according to the motto: It is not important to win but to have fun. And recently we have lived up to that motto, as shown by the results in the last few years. According to GSC, we have to umpire other C-League games, which is easy and mostly fun. Also, we (meaning you) provide drinks and snacks for during and after the games on a weekly basis. Dinner is sometimes had after the games if enough people are interested. No drinking during games. The first offense, the player is suspended one game and the team is put on warning. The next offense the team is booted for the rest of the season and they forfeit their $40.00 deposit. Captains, you are responsible for all members of your team reading, understanding, and following these rules. Please contact John Carter at ext. 3252 or email: jcarter@caltech.edu with questions and/or concerns. I would strongly suggest that you get out and throw a softball a bit between practice days. Don't throw too hard initially, we don't want to have sore arms before the season starts (but we do want to have *strong* arms and good aim). We should start going to the batting cage early and often. I am willing to take a large group once or twice, but I would suggest that people go individually or in small groups. In a small group you will finish much more quickly and have more time to bat. I have a map and other info if you want it (the prices may be out of date because the flyer is from last year). 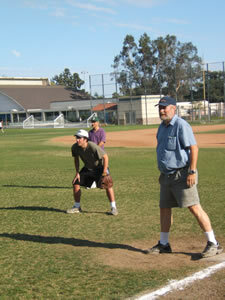 Many people have strained muscles in practices and games in past years. It is easy to do this playing softball because much of the time is spent standing and sitting. When a play has to be made or a bases have to be run, the muscles involved are relatively cold and stiff. Before any practice or game, you should stretch your arms, legs and back. Before batting you should stretch again (batting, in particular, can be hard on the back). Don't stretch too hard, just to the point of comfort. Don't bounce when stretching -- begin a stretch and then hold it for 20 or 30 seconds.